The Art Gallery of South Australia, founded in 1881 is home to one of Australia’s great art collections, housed in one of Adelaide’s most beautiful buildings. Located at the heart of Adelaide’s cultural boulevard, North Terrace, the Gallery welcomes more than half a million visitors each year. 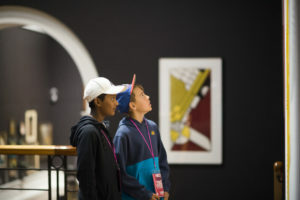 From 2009 to 2014, The Balnaves Foundation supported the Art Gallery of South Australia to develop and deliver a program for children aged between five and ten. The START at the Gallery program, introduces children to the Art Gallery and sets the groundwork for a life-long love of the arts. In 2015, as START was well established, in consultation with the Art Gallery it was agreed that The Balnaves Foundation would shift to support a new program for teenagers aged 13 – 17 years. The NEO program brings teenagers into the Art Gallery to engage with art in a social setting enlivened with live music, film screenings, food and beverages, art making activities and conversations with artists and much more. Since 2012, The Balnaves Foundation has also supported the Adelaide Biennial of Australian Art. The Adelaide Biennial is the country’s longest running survey of contemporary Australian art and represents the galleries dedication to showcasing up-to-the-minute works by Australian contemporary artists. Find out more about Art Gallery of South Australia here.